You know how every driver and car in NASCAR is plastered with brand logos? 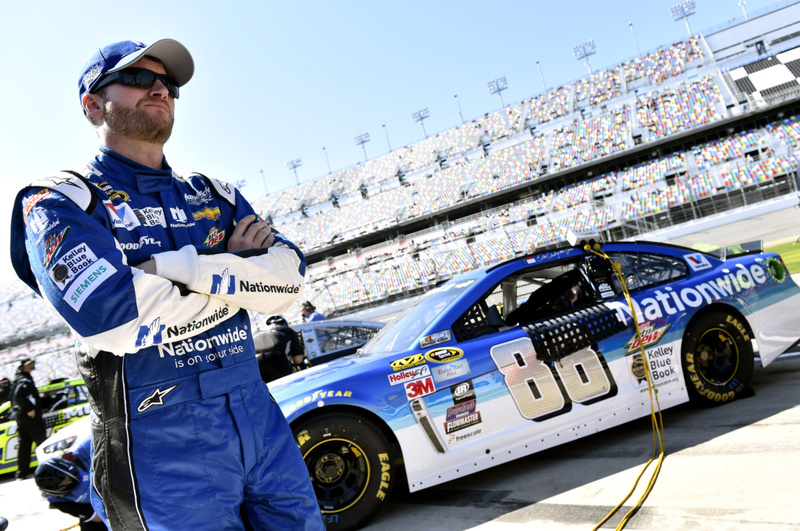 So if and when Dale Earnhardt, Jr., for example, wins a race in 2016, millions upon millions of NASCAR diehards will suddenly have the Nationwide logo — or Siemens', or Mountain Dew's — lodged at least in the back of their minds? Well, what if politicians had to do the same thing? Picture it: There's a big bill coming to the floor. It's a bill that would impose a new tax on financial transactions. It's vigorously opposed by Wall Street. And then a politician takes to the rostrum and explains at length why his conscience and sense of responsibility to the Constitution and liberty will not allow him to support this measure...but it's hard to pay attention to anything he's saying, because his suit is plastered with the logo of every big bank and hedge fund you can imagine. You might not take that guy's words too seriously, right? Maybe he'd reconsider and skip the vote instead. It sounds like a skit from "Saturday Night Live," I know. But in a post-Citizens United America, one in which the laws governing campaign finance are tissue-thin (at best), some are starting to think that exposing the system as parody-proof might be galvanizing. If nothing else, it would be strange, different, amusing — and, in a gallows humor way, kind of fun. So one group out in California is taking advantage of the state's ballot initiative system and giving it a shot. And the public's response thus far, they say, has been more enthusiastic than they imagined. Recently, Salon spoke over the phone with John Cox, the chairman of the California Is Not For Sale Initiative, about the idea; its origins, its purpose, and simply how it would work. Our conversation can be found below and has been edited for clarity and length. So let's cut right to it: Why are you doing this? The reason we're doing this initiative is to highlight the absurdity of a system under which people who want something from government fund and staff the campaigns of the people who make the decisions about giving them that stuff. Any other planet, every other solar system would say that that is corruption. I mean, that's the definition of corruption, right? But we put up with it in this country, and in particular in California. And that's just not right. I think the public is waking up to it. They're seeing it in the campaign for Mr. Sanders, and to some degree they're looking at that in the campaign for Mr. Trump, who said he's not going to need money. It may be part of his attraction, I don't know. I haven't figured out what his attraction is yet. But be that as it may, he's making the same argument: he can't be bought. It's about time we did something about it, and that's what this initiative is all about. It's why reform groups across the country are calling us and wanting to help, and frankly, we're circulating petitions for signatures now in California and the circulators we have out there are telling us that this is the most popular initiative they've ever circulated. Can you tell me more about the initiative? What are you proposing, exactly? The initiative is a statutory change that will basically require every state legislator in California - there are 120 - to wear the logos of their major sponsors, their 10 biggest donors. It'll be like NASCAR drivers or race car drivers or golfers or tennis players who wear the logos of their sponsors. They only have to wear it when they're casting votes or giving testimony, they don't have to put it on their pajamas before they go to bed at night. We have the opinions of lawyers that it passes constitutional muster. It's needed to inform the public as to who's involved in supporting these people. The initiative is meant to ridicule an absurd system and focus people on finding a solution to it. I believe there are solutions. We're going to be talking about one that we think is a solution, and that will come in 2018, but now we're happy just to get this on the ballot, get it passed, get people to focus on correcting the imbalances in this system under which big businesses and big unions and wealthy donors basically control our politics. So, hypothetically, let's say a legislator is about to vote in favor of an offshore drilling bill, and she just so happens to be the recipient of a lot of donations from the fossil fuel industry. Would we then see, on her lapel or somewhere, like an Exxon-Mobil logo? Our initiative very specifically says that [the logo] must be visible — and readable — to a member of the audience. Some people have suggested, "These guys will just make it microscopic on their clothing." No. The law says it's got to be readable by a member of the audience. I'm gonna leave [the details] to the bureaucrats. There's something called the Fair Political Practices Commission in California, and they prescribe rules on implementing the Political Reform Act. Our initiative amends the Political Reform Act and it gives the authority for regulation to the Fair Political Practices Commission. When did you decide to start thinking about this seriously and actually trying to make it happen? We came up with this over the summer and we did a demonstration of it down on the state capitol steps. It's on our website, people can go to our californiaisnotforsale.com and see it. We created 120 cardboard cutouts, full-size, with every legislator there in their suit and we plastered these stickers on them and we put this on the steps of the capitol. It was so popular. We had crowds gathered around us, we got some decent media out of it. We said, "You know what? This is a good idea. Why don't we put this in the form of a ballot initiative?" Because it seemed to get people interested in the topic. That's why we came up with it. We didn't come up with the idea originally, by the way. Our consultants, our PR firm had found it on the internet. I guess Bill Maher had dressed up in a coat for an interview with Larry King many years ago and I think Robin Williams had also joked about it. So I think comedians have been joking about how politicians should be dressed up as race car drivers for years. I wish it were original to us, but it's not. But it is original from the standpoint that we're actually going to put it into practice. And that's what's gotten people excited. It's across the spectrum. It's not just people on the left side, it's people on the right, it's people who are just disgusted with the structure of this system. I always say, the debate is not between the right and the left anymore, or the Republicans and Democrats; it's between the corrupt and the non-corrupt. And right now, I think the corrupt are winning in most situations. Is your goal to raise awareness, increase exposure, and make it a topic of conversation? Or do you hope this measure actually impacts politicians' behavior? Or both? I don't think it's really going to impact their behavior, frankly. There have been a million solutions that have been proposed over the years. Term limits was supposed to be the silver bullet; it didn't work. California has had term limits for 20 years and its legislature is still captured by business and unions and wealthy donors. Other ideas, like disclosure or making sure that independent expenditures aren't coordinated and prosecuting coordination, these were all supposed to be solutions that would work; and they haven't. We're going to be talking about a solution in 2018 that we think works. There are other people who think other things like public financing might work. The purpose of this initiative in 2016 is to first focus ourselves on the problem so that we start looking at these solutions and finally get serious about enacting one. What do you want people to think or feel in response to the initiative? When you look at these politicians with these stickers plastered on them, you get it. You realize, "Yeah, this is funny; but this is the system." This is the ridiculous, absurd system we have. Realization is the first step. It's almost like alcoholism; they tell you you have to recognize the problem before you can solve it. That's the same thing here. You have to recognize that we have a real problem — and really have it hit home — before we finally get around to solving it.